The forest around the trail to Taktsang Monastery in Paro is home to five plant and 33 bird species. 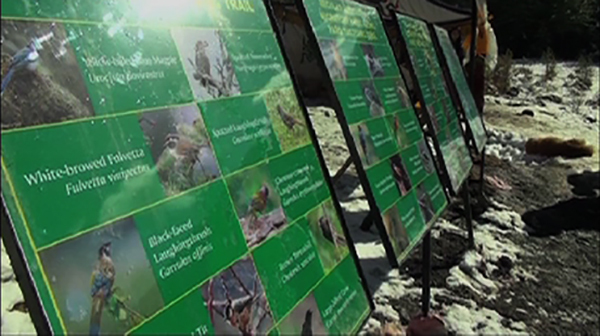 The Bhutan Ecological Society has put up signage of the species. There are a total of 14 signs that have information about the species that can be seen on the hike. The signage was inaugurated on Wednesday. The World Wildlife Fund (WWF) supported the initiative. The tree species are rhododendron, blue pine, hemlock, populus and brown oak. Of the 33 species of bird, 10 are residential and others migratory. “There are a lot of species of animals and plants in a very small area and this is amazing,” Kencho Tshering with Bhutan Ecological Society said. The Bhutan Ecological Society urges people to refrain from damaging the signage. “The signboards for plants were uprooted and thrown far away. We don’t know who did it but we put it back. But again people have tried pulling it out. We request people to support our initiative,” Kencho Tshering said. The Bhutan Ecological Society plans to put such signs in place on the trails throughout the country.